We offer storm damage repair to roofs that have been affected by wind, or hail. It isn’t always readily visible, and can take up to six months or more to become evident. We recommend you call us after any major storm to be sure there is no hail or wind damage to your roof. Our roofers are available 24/7 to fix your roof after a storm, call us now! If storm damage doesn’t get addressed rapidly, it can lead to more serious damage of your home or business, including interior damages that can result from leaks, etc. If you need emergency roof repair, we will not only be there any time of day, but we can often help with the insurance claims related to these so that the insurance company can cover the expenses, and your home or business stays protected without the extra hassle. We even have licensed insurance adjusters on staff here, and we will help you with your claims! Call us right away if it’s urgent, and we will handle any storm damage repair needed to keep your property safe. 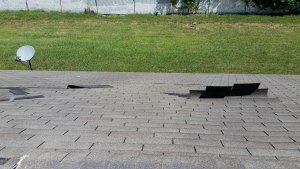 Storm damage repair for roofs is something that should be addressed promptly after any major storm, though it frequently takes months to surface. If you notice any warning signs such as cracks, leaks, missing shingles, or symptoms with your roof that haven’t been there before, call us. We’ll do a prompt and thorough inspection to make sure there is no danger to your home or commercial property, and give you an affordable estimate if there is work to be done. If there is storm damage repair to be done on your roof, it’s not something you want to push off. 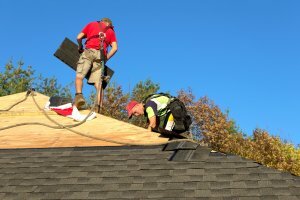 We are professional roofers who have been leading the area in affordable, quality roof repair for over four decades and will give you a good deal. We will make sure your investments stay secure, with service that gets completed rapidly and to the highest standards. If you suspect there is previous damage that went unnoticed, don’t wait to get it checked out by a roofer. It will only get worse over time and could potentially lead to roof replacement or serious roof repairs needed, depending on the extent of the storm damage. Contact us to get it fully repaired the right way. We’ll take note of any damage and document the date and time of the storm. This being done, we can notify your insurance company and protect you against any damage that hasn’t shown immediately. Then our adjuster can work with your insurance company so they compensate you for the needed repairs and your roof doesn’t lose any time off its lifespan due to unhandled storm damage. There are factors to consider as far as the resiliency of your roof, and its likelihood to sustain damage. New asphalt shingle tiles are more resilient to hail impact than older shingles are. The older the shingle is, the more likely it is to need storm damage repair. Also, warmer shingles are more resistant than cold ones. If there is a serious storm in the winter or colder months, you’ll want to make sure you get a storm damage inspection as soon as you can. Also, shingles with a structurally sound under layer (substrate) will have more resistant qualities. We strive to do the right thing by sticking to higher standards and keeping our integrity in all of our services for our customers. If you need storm damage repair, call us. We provide storm damage repair in Bentonville, Springdale, Fayetteville, and nearby areas.